ENCHANT have been singing regularly together for over 12 years. Originally set up to offer choral music at friends’ weddings, we have now expanded our membership and repertoire to perform at many different events and venues. Over the years we have led music at cathedrals such as Gloucester, Chester and Coventry. We have also helped raise money for various charities through church concerts in Birmingham, including St. Paul’s in the Jewellery Quarter, Birmingham Cathedral and St. George’s, Edgbaston. 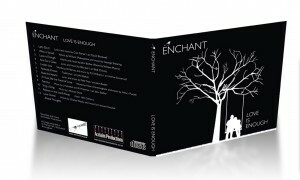 In recent years Enchant have promoted their own Christmas concert ‘An Enchanted Christmas’ which has rapidly grown in popularity and offers a unique experience for the audience with choral music, instruments and projections. We also continue to perform new works by our conductor John Barber. Both of our Cd’s have compositions and arrangements by him and many of our performances usually showcase these unique pieces.